The first fifty levels of weapon skill, is the most important levels to gain, after that you do not get much more firepower. 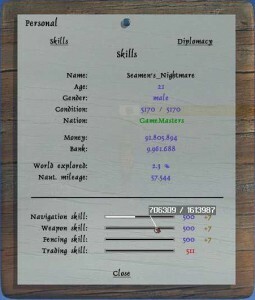 There is a very simple equation, to find how many weapon skill points you need for each level. Where level is the level you already have. Example if you have weapon level 20 and you want to know how many point to get to level 21, you simply type 20 x 20 x 120 = 48000 points. 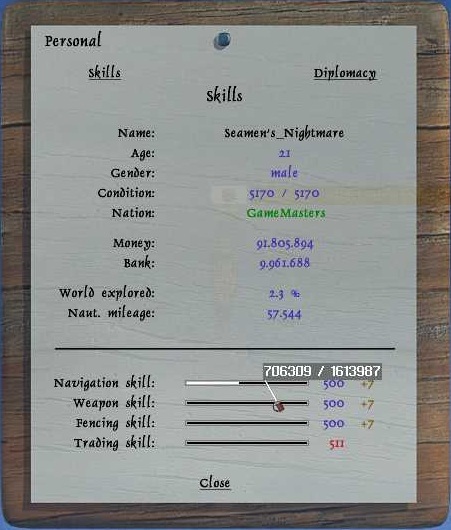 You can also see how many points you need, by using the right click menu and click personal. By holding the curser over the line it tells you how many points you have and how many are needed. You can hire specialists called cannoneer, to help you get more weapon skill, cannon range and firepower. It is recommended that you use at least Barque, preferably higher ship class, when doing weapon skill. you cannot gain weapon skill by shooting cities or into the water or land. the more points it is possible to get per hit. The weapon point also depend on what type of ammunition you use, explosive give the most points, shatter ammunition gives a little less and standard ammunition gives the fewest points. You can sail around shooting at random ships that spawn or you can do scuttle jobs at a city. Scuttle job means sink the pirate NPC, this is best done with explosive ammunition. You can get different ships classes as scuttle jobs, depending on the port and your flag ship.